This week our top story for China’s media is the case of Kong Linlin (孔琳琳), the CCTV reporter who made a scene at the UK Conservative Party conference in Birmingham. Kong’s case is an interesting (and quite discouraging) look at the growing assertiveness of Chinese official voices, both media and diplomatic, in international contexts. We can surely expect similar displays of bullying and outrage in the future over issues China’s regards as being in its core national interest. In this case, the issue was Hong Kong. The discussion internally in China of the Kong Linlin case was limited to social media platforms, and the overwhelming majority of responses seemed to be positive and in support of Kong’s temper tantrum as a matter of patriotism. We translate a portion of a rare WeChat post adding a bit of context to the case — talking about how such shows of “patriotism” are the real role of state media in China, which have little interest in professionalism as much of the rest of the world understands it. One of the most disturbing aspects in China on the Kong case is the tacit support and legitimization of violence when it is seen as serving the fundamental interests of the Party and state. Facing questions of whether it was proper to strike others as she did in Birmingham, Kong responded on Weibo with a smiley face emoticon: “It’s not hitting when it’s legitimate self-defense (正当防卫).” Note that the Chinese here for “legitimate self-defense” suggests defense not just of Kong’s person but of the body, as it were, of the Chinese nation. On September 30, as the Human Rights Council of the UK Conservative Party held a fringe event on the situation in Hong Kong during its annual Conservative Party Conference in Birmingham, panel members, included several prominent Hong Kong pro-democracy figures, were heckled by a reporter for the official China Central Television, Kong Linlin. As the hosts of the panel tried to get the woman to leave, she appeared to slap and event volunteer twice. The exchange was captured on video. Addressing the embassy statement, the deputy chairman of the Human Rights Council of the UK Conservative Party, Benedict Rogers, said the absurdity of the Chinese Embassy statement was clear to anyone who viewed the video from the scene. More than 80 eyewitnesses at the event saw this Chinese journalist slap our volunteer twice, Rogers said. Rogers said that the journalist should immediately apologize, and the Chinese government should withdraw its statement. For nuance on the Kong Linlin story inside China, it was necessary to look at the reflections appearing on the WeChat platform. One example we found was a post at “Shen Mutian” (沈目田), which was called: “Media Must Be Surnamed Party, And Journalists Must Be Surnamed Party.” This was a reference to President Xi’s speech on media policy in February 2016, when he stressed that all media work in the interests of the Chinese Communist Party. That speech came with visits to Kong’s outfit, China Central Television, and to the People’s Daily. CCTV, which takes the lead in shouting the the media must be surnamed Party, has recently also “sought sunlight for the nation” (为国争光). 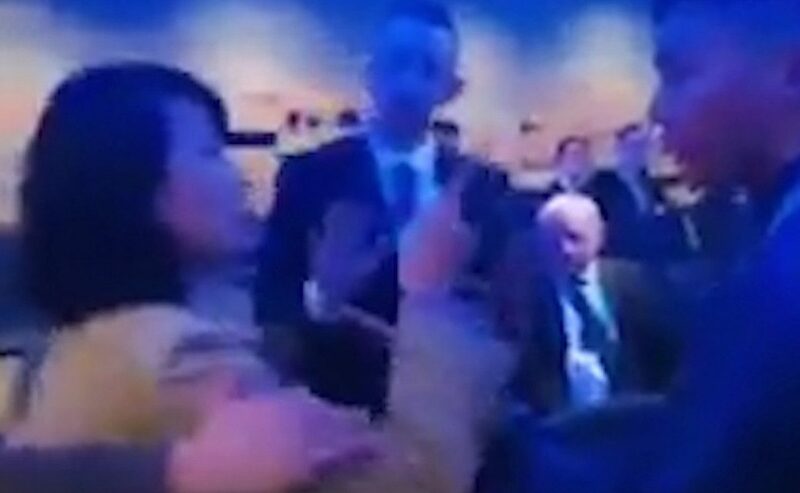 A CCTV female reporter called Kong Linlin made a big fuss at the annual conference of the UK Conservative Party, engaging in a verbal war of words and even hitting people. 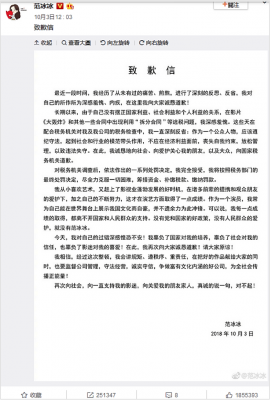 Kong Linlin’s “patriotic” move received a lot of support from “patriotic” internet users. Afterward, some suggested that it was not right to hit people. Through her Weibo account, Kong Linlin explained by saying that legitimate self-defense (正当防卫) is not the same thing as hitting people, and the post came with a smile emoticon. 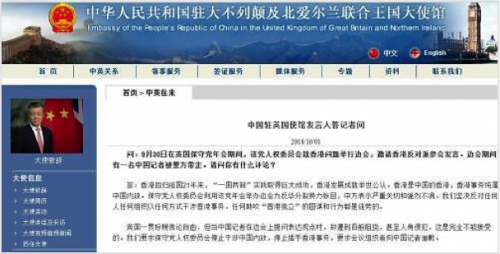 Concerning this question, former journalist Luqiu Luwei (闾丘露薇) said that this journalist based in London had exposed a core aspect of the Chinese media system: that the media serve the Chinese Communist Party, and that they must revere the Party. Daring to ‘show the sword’ was precisely the prerogative of these propaganda workers, and so seeing the high-level support officially and the energetic support back home is not at all a surprise. This is [for them] about responsibilities, and demanded by the media system. The definition of a journalist officially in China is very different from the professional definition provided in classrooms overseas. This is common knowledge. Actress Fan Bingbing (范冰冰), one of China’s most recognized celebrities, resurfaced as tax authorities in China announced that she had been fined for “shadow contracts” and tax evasion. In an apology shared widely across social media, Fan said she was sorry and would “engage in deep reflection” over the matter, that she felt “ashamed and guilty” (羞愧、内疚). An October 3 announcement from tax authorities said that in the process of making the film “Unbreakable Spirit,” directed by Xiao Feng, in which she stars with American actor Bruce Willis, Fan Bingbing received “shadow contracts” that enabled her to evade more than 6 million yuan in personal income taxes, and more than 10 million yuan in small business taxes. In total, the authorities said, the actress would have to pay more than 800 million yuan in fines and back taxes. In language reminiscent of public confessions seen in recent years in China, she also thanked the Chinese government and the Chinese Communist Party for the opportunities afforded to her. Online in China, views of the Fan case were varied. Some wondered at the fairness of Fan receiving only fines for tax evasion involving enormous sums when Li Xiaohang (李晓航) a former airline stewardess involved in cosmetics sales, received a prison sentence of 3 years for evading just over 1 million in taxes. 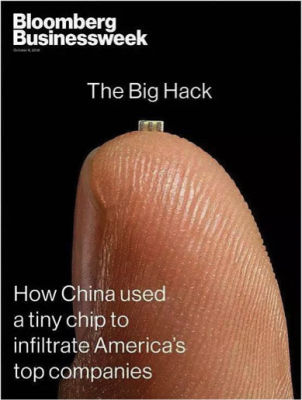 A report published on October 4 in Bloomberg Businessweek alleged that Chinese spies had hacked into the networks of nearly 30 U.S. companies, including Apple and Amazon, by using a “tiny microchip, not much larger than a grain of rice,” imbedded in server motherboards sourced from China. The report, which quickly sent ripples through tech and foreign policy communities in the U.S., seeming to substantiate calls for a harder line on China (one lawmaker calling it the “holy grail of hacking”), was denied by at least three of the major companies involved, Apple, Amazon and AMD. Super Micro, the supplier mentioned by Bloomberg as the source of infected motherboards, denied that its products contained such chips, which it said had never been found in its products. Official state media in China remained silent about the case through October 5, but there was some discussion across tech sites and WeChat public accounts about which version of the story to believe. A post at the WeChat public account “Gui Xing Ren” (硅星人), did a full summary of the Bloomberg report and related coverage and then proceeded to look carefully at a number of “odd points” in the stories. The post bore the headline: “Bloomberg Exposed ‘Spy Chips’: I Can Buy One on Taobao for 1 Yuan” (彭博社曝光的“间谍芯片”，我在淘宝1块钱就能买一个). According to an October 4 report from the official Xinhua News Agency, the new “Regulations on Internet Security Supervision By Public Security Organs” (公安机关互联网安全监督检查规定), released by the Ministry of Public Security last month and due for implementation on November 1, 2018, will extend broad policing powers to local and central-level authorities in ensuring cybersecurity broadly defined. The regulations stipulate that public security organs may enter places of business where companies are engaged in the provision of internet services, inspecting computer rooms and offices, and requiring “responsible persons” of these companies or employees dealing with network security to explain information and procedures relevant to cybersecurity. The regulations specify that copies of these materials and information can be made available to police on request. Official media in China explained the regulations as a means to provide greater security from such dangers as hacking, but the breadth of the regulations ensures that they can also be applied for the purposes of information control. In fact, police in China have long had the power to act in the way outlined in these new regulations, but these serve the purpose of formalizing this power. The full text of the new regulations is available here. PreviousHow Will China Respond to the Victor Mallet Case?